Definitely the most common of the 3 myths, right here. Not sure where this myth came from, but I would have to think that it was born from logic. As in: the sky is blue, grass is green, so naturally steel should always be a greyish silvery color, right? ...Wrong! 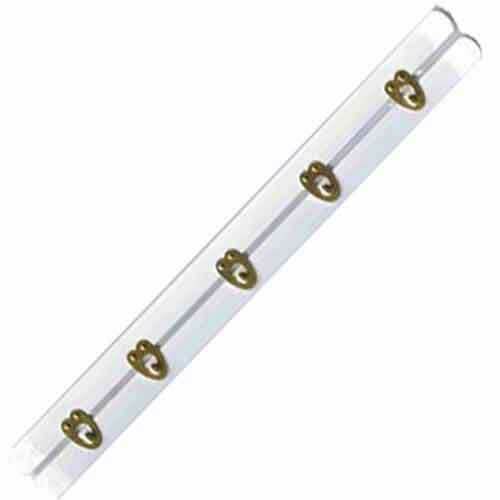 Flat steel bones are frequently dipped in a white coating, and both flat and spiral steel bones tend to have a rounded plastic tip at their top and base. These treatments, which do not always leave the steel in its original color are actually signs of a quality steel bone. The dip helps prevent rust and wear and the tips help prevent the fabric of the corset from fraying and the seams from splitting. This is a myth most likely perpetuated by other corset retailers who are trying to pawn off a cheaply made, low-end corset as one of high quality. 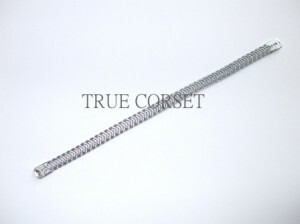 A quality corset will only feature flat steel bones in 2 spots: the front busk closure will consist of flat bones and the back boning, where the corset features its grommets and lacing, will also be flat steel bones. Any corset that features flat bones throughout and either no spiral steel bones, or only 2 steel bones going over the centre of the bust, are poorly designed, less expensive to produce and not worth your time. Now, it is important to differentiate that just because flat steel bones are generally less expensive, this doesn't mean that they are "cheap" or of poor quality. What it does mean, is that because they are flat and because they are more dense than a spiral steel bone, they will do nothing more than add unnecessary weight to the corset, not mold/shape to your curves as smoothly as spiral steel bones, and because of their less expensive cost, they will allow who ever is retailing them to enjoy a larger profit margin at your expense. For those of us who do have a magnet available, it is important to know that it will not always stick as firmly to the corset's boning as it would to any other surface the magnet could attract. In most cases, this is due to a combination of the white, non-metallic coating that flat bones are encased in, the fabric the corset is made out of (e.g. something thicker like velvet puts a greater barrier between the magnet and the bone), or it could be because you are testing the magnet too far down on the boning at the tip of which there is normally a rounded plastic tip to reduce friction on the fabric/seam and prevent fraying or splitting. If you are gentle with the magnet and pay good attention when bringing it close to the corset's boning, you should be able to feel the magnet attract to the bone, even if it isn't an extremely strong pull. And there you have it: 3 myths about steel bones debunked!